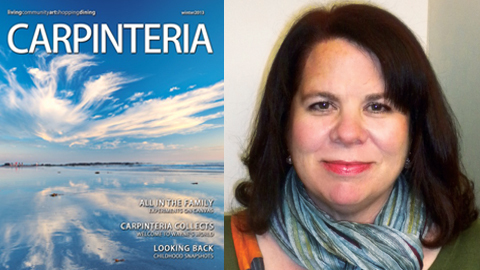 Amy Orozco is the editor of Carpinteria Magazine and the former editor of Carpintiera’s weekly newspaper, Coastal View News. She also runs Orozco Ink, a writing and editing business. Leslie A. Westbrook: Describe your business. What do you do? Why do you do it? Amy Orozco: I am an editor and writer. Most of my writing involves newspaper and magazine journalism. My style is clear and concise, which also puts me in demand with government agencies, businesses, and nonprofits. AO: I became official in January 2008. AO: Not that I do this differently than anyone else, but I’m part of the dying breed that takes a deadline literally. It’s not a target date. I’m always surprised by the number of clients who are surprised that I finish jobs on time, or earlier. AO: Do what you said you would do and by when you said it would be done. When it comes to billing, err in favor of the client. LAW: Why did you join the Association for Women in Communications? AO: To be around professional women in my field. I also thought that through the magic of osmosis I’d be inspired, that professional development would be a natural by-product of membership. Plus, I’m lucky to work and live in Carpinteria, but it’s good for me to get out of here every once in a while. LAW: Do you have any upcoming events or anything else the chapter members should know about? Toot your horn! AO: I’ve completed a series of architectural guides. You can check them out at dylanchappell.com. I’ve become more serious about my blog. By serious, I mean being regular and trying to up my followers (this is supposed to be an excellent thing for a writer to do). Also, my friend/writing partner and I have finished a play we’ve been working on via google docs for over a year. We’re going to have a reading in the next couple of weeks. The working titles are Nursing Home and Shady Ends. The play is a comedy. LAW: Tell us anything else we should know about your business and/or you. AO: I worry a lot about hurting people’s feelings. As an editor I have to say “no” a lot. Add to that the constant tick-tock of deadlines. Now you have a winning combination for sounding curt, abrasive, and mean. LAW: When did you know you wanted to be a writer/editor? AO: I’ve always been a writer. The belief that I could actually earn a living doing this job came in my late 30s. I’m 54 now. I can’t believe what an excellent job I did of ignoring, or not believing, all the obvious signs that I should write for a living. LAW: Many people might be surprised that you have recently appeared on stage/pounding the boards at the Carpinteria Playhouse. Does acting work a different part of your brain and/or allow a more gregarious part of your personality to express itself? How did this happen? AO: I defy the stereotype of the quiet, introspective, solitary life writer. I like to think I also defy the stereotype of the “whack job writer.” I’m more the ringleader/class clown type. With friends and family I’m usually the hambone. Performing on stage takes that side of my personality to a new level. Actually, I find the stage a lot easier and safer than I find sharing my personal writing, such as the play. I’ve organized an Improv workshop at the Carp theater. We’re in our second year. And growing! LAW: How can members and friends of AWC-SB help you in any of your endeavors? AO: Keep being the best at what they do and sharing their expertise. Keep being friendly and welcoming at meetings. Become a follower of my blog. Remember me when writing jobs surface. LAW: Phone, text or email? How do you communicate these days and can you comment on each? AO: Not surprising for a writer, email works best for me. The phone is fine, but I always follow up conversations with an email. Embarrassed to say I don’t text. I know how; it’s that dealing with cell providers is such a pain in the neck I haven’t gotten around to signing up for the service. LAW: How do you get the word out about your business or projects? AO: I’ve been fortunate with word-of-mouth, which is great because I am t-e-r-r-i-b-l-e at promoting myself. I want to raise my professional bar, earn more money, and widen my circle, so I’m going to give networking, social media, and marketing a real go this year. LAW: What are the unexpected challenges and joys of your new Carpinteria office? AO: Challenges: In the fantasy of having my own office, I was always at my desk writing away by 8 am, and I was perfectly coiffed and groomed. Getting out of bed in the morning remains the singularly most difficult thing I do each day. Once I’m vertical, it is full speed ahead, but getting there … oy vey. LAW: Anything else you’d like to add? Any tips for our members about Carpinteria? AO: Carpinteria has a lot of good restaurants, which is a big change over the last 10 years. Also, Carpinteria has no desire to be like Santa Barbara. Where some people get that idea, I have no idea. This entry was posted in Featured Members on January 27, 2013 by Lisa.